Where does the time go? The end of the school year is upon us! Gemma graduated from Pre-K today, and I was a bit teary-eyed as she performed her last preschool show and walked to get her certificate before shaking hands with her teachers. 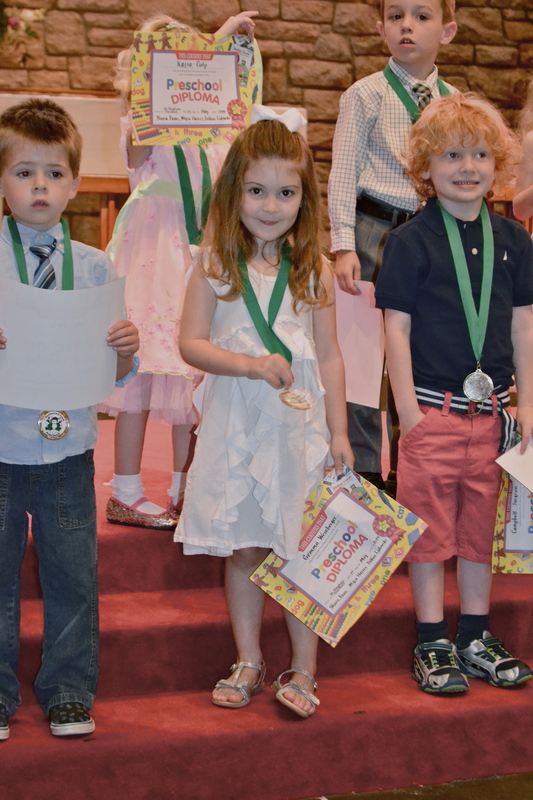 We have been very blessed to have such a warm, engaging preschool environment at St. Stephen’s Episcopal Preschool for the last three years. Gemma’s teachers over the years were always such a joy, offering their kind souls, encouragement, guidance, patience and smiling faces every day in each classroom. If you live in the Durham/Chapel Hill area and are searching for a wonderful preschool, I highly encourage you to check out St. Stephens! 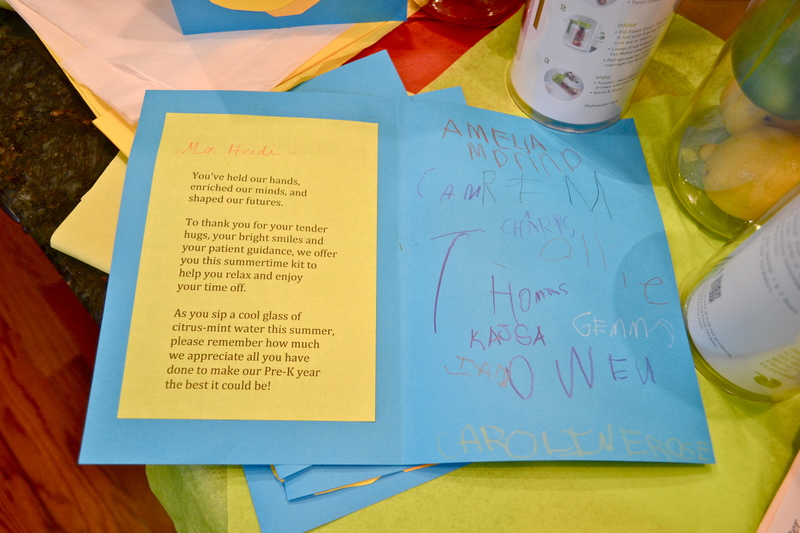 To honor the Pre-K teachers at the end of this school year, the parents got together to give our three classroom teachers, a music teacher and the preschool director a fresh, practical gift they and their families can use throughout the year, especially during our warm summer months. 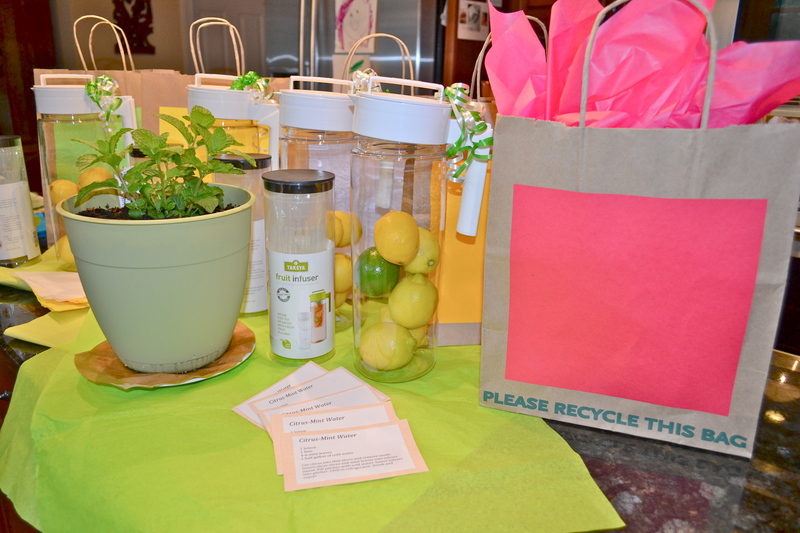 We gifted each teacher with a water infuser/pitcher (Crate and Barrel) filled with lemons, limes and a sprig of fresh mint plus their own potted mint plant (Home Depot). 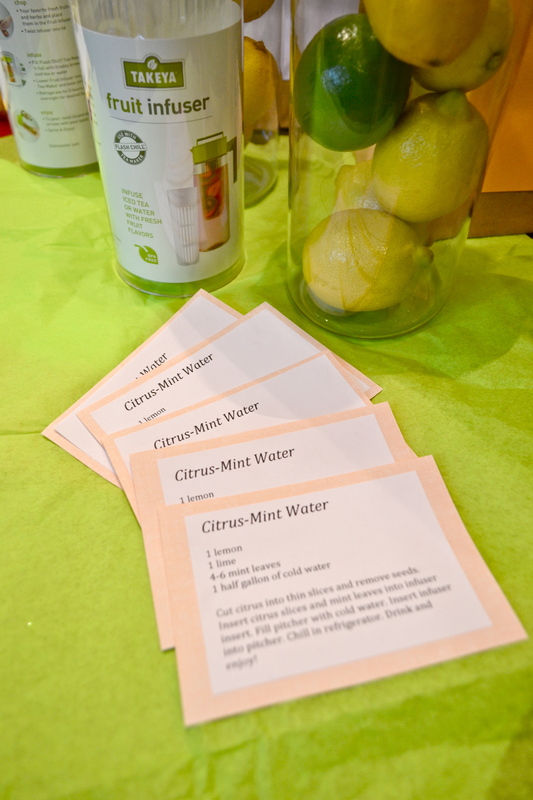 We included a recipe for Citrus-Mint Infused Water, and the kids all autographed a special card. Cut citrus into thin slices and remove seeds. 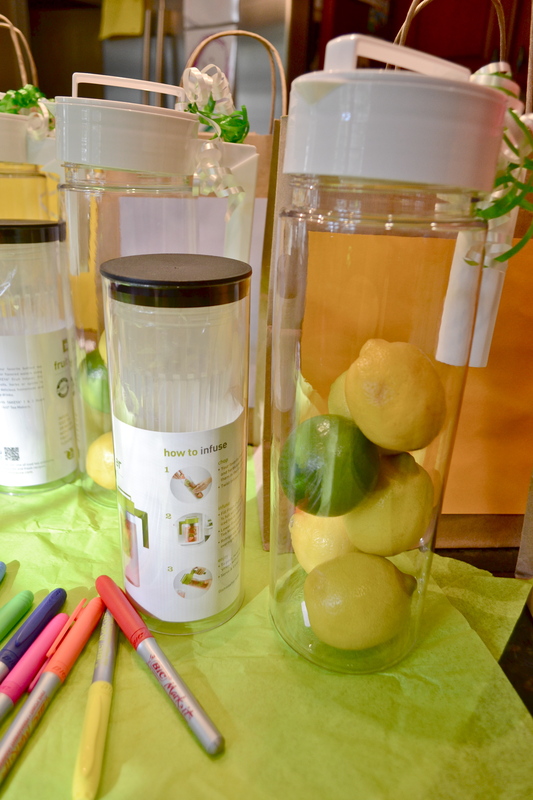 Insert citrus slices and mint leaves into infuser insert. Fill pitcher with cold water. Insert infuser into pitcher. Chill in refrigerator. Sip and enjoy!!! I also love these four recipes from Lauren Conrad (orange-lemon-lime; lemon-raspberry-mint; lemon-cucumber-mint; and blackberry-cherry-lime). If you get bored with plain ice water, as I do, an infuser is a great way to offer your body nourishment with a wonderful flavor! Recycle those paper bags from grocery or retail purchases! Don’t want the Whole Foods logo emblazoned on a gift bag? 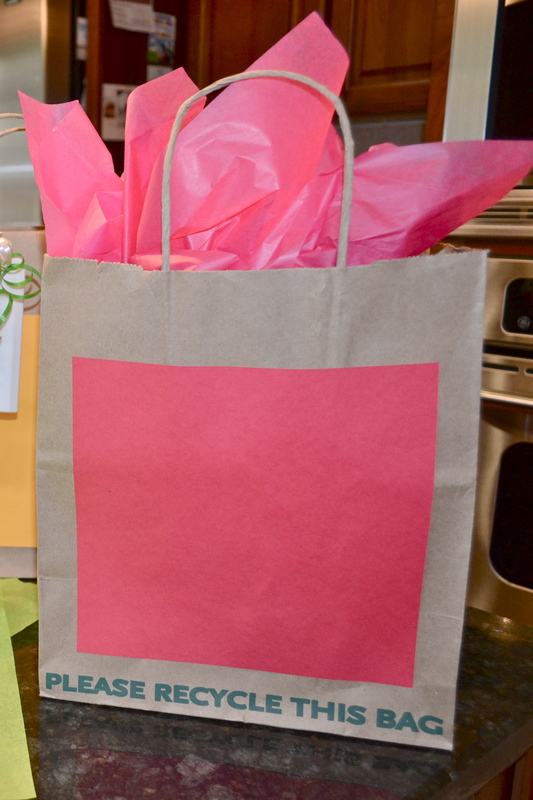 Just use colorful paper (or some of your child’s drawings on paper) to mask the logo and create a fun, colorful bag appropriate for gifting! When gifting a potted plant, be thoughtful of your recipient’s ability to transport (if it’s not going to their home directly). I made sure to drain as much water from the pot base before placing the pot on a stack of coffee filters (to help absorb moisture) and then wrapped the base of the pot in a plastic bag to catch additional leaks. 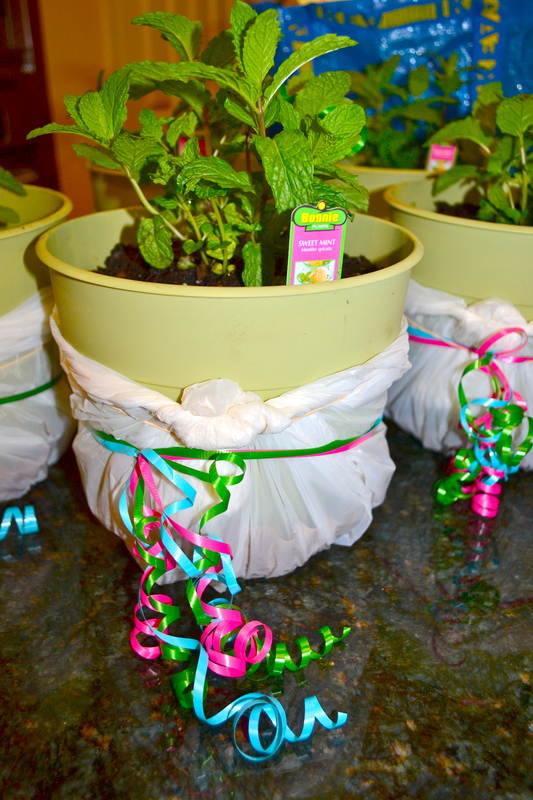 You can then use ribbon or a bow to decorate the bag or pot and give it some flair. 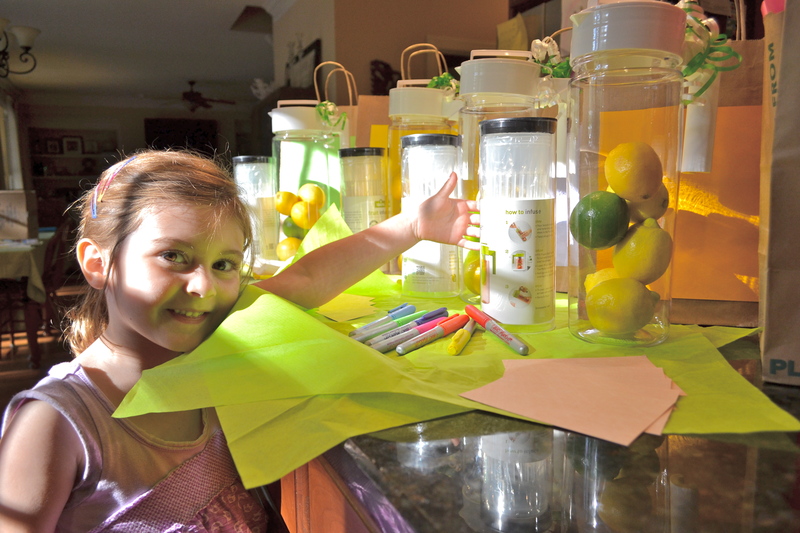 This entry was posted in Kid Stuff, Life, Recipes, Tutorials and tagged citrus mint water, citrus water, end of year teacher gift, infused water recipe, mint planter, plant for teacher gift, potted mint, pre k graduation, recycled gift bags, st stephens episcopal preschool durham, st stephens preschool, teacher appreciation gift, teacher gift, teacher recipe, water infuser. Bookmark the permalink.